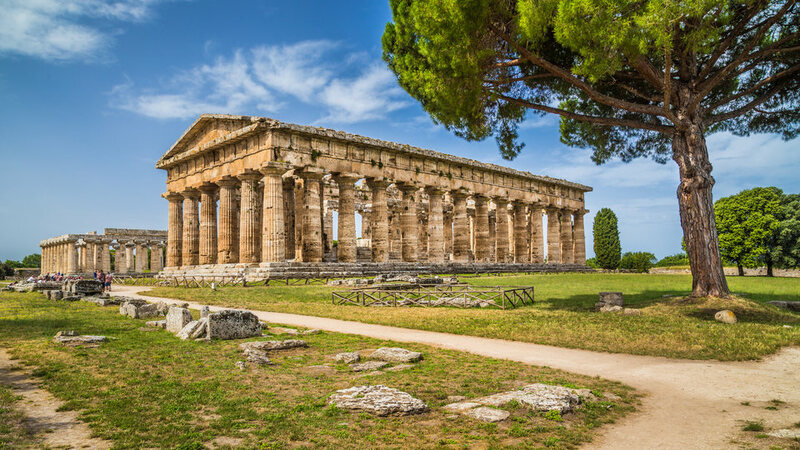 Listed as a UNESCO World Heritage Site, the archaeological site at Paestum, in the Italian region of Campania, can be visited as a day-trip from Salerno or the Amalfi Coast, and takes as much as three hours to stroll among the ruins and admire the splendor of its ancient Greek temples. 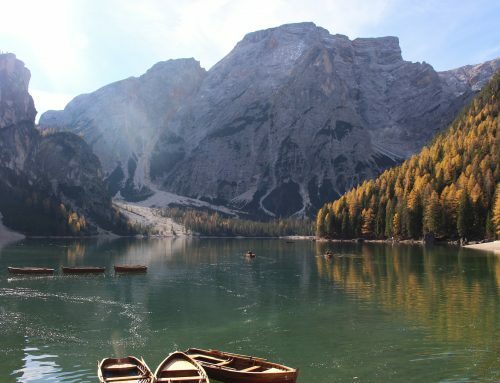 Lacking the tourist crowds that flood Pompeii, Herculaneum and Torre Annunziata each summer, this place has a beautiful sense of peace and majesty. It still feels as if God had built his own house out of those huge masses, as German philosopher Friedrich Nietzsche said, after having visited Paestum on one of his excursions from Sorrento. 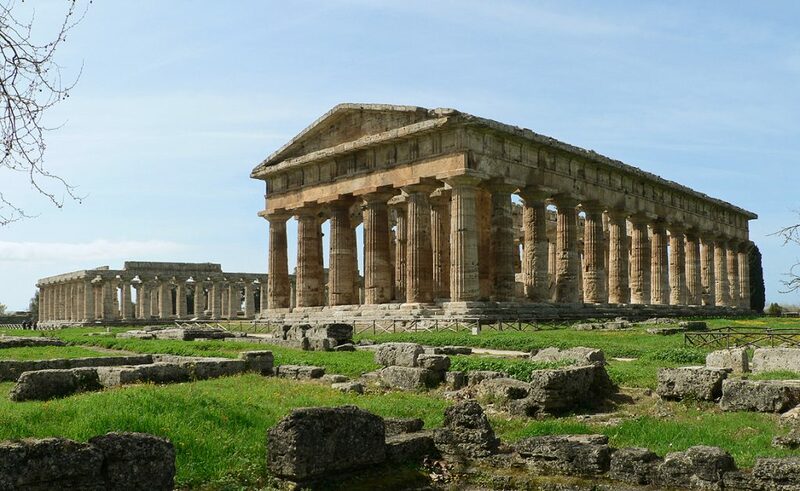 It is no surprise that Paestum was a mandatory stop of the so-called Grand Tour, the traditional trip of Europe undertaken by upper class European young men. The best time of the year to visit the archaeological site at Paestum is spring, when the weather is mild and sunny and the Doric temples are spectacularly surrounded by scarlet poppies. Just opposite the archaeological site, the National Archeological Museum at Paestum houses the Tomba del Tuffatore (Tomb of the Diver), the finest known example of Greek wall painting of the 5th century BC. The archaeological area covers the heart of the ancient city of Poseidonia, later called Paestum, built by Greek sybarite colonists in 600 BC. It flourished and now has the most extensive ruins of Magna Graecia, the Greek colony that covered most of Italy’s south. 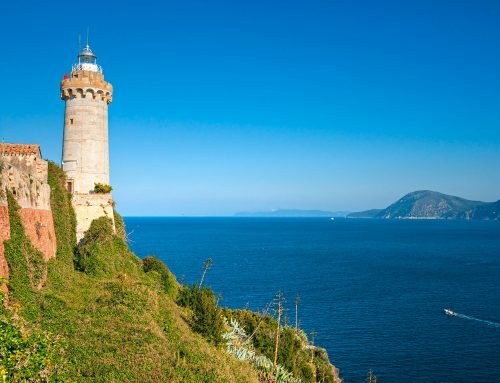 Around 400 BC, Poseidonia was occupied by the Lucanians, a barbarian tribe which reused the already existing structures. 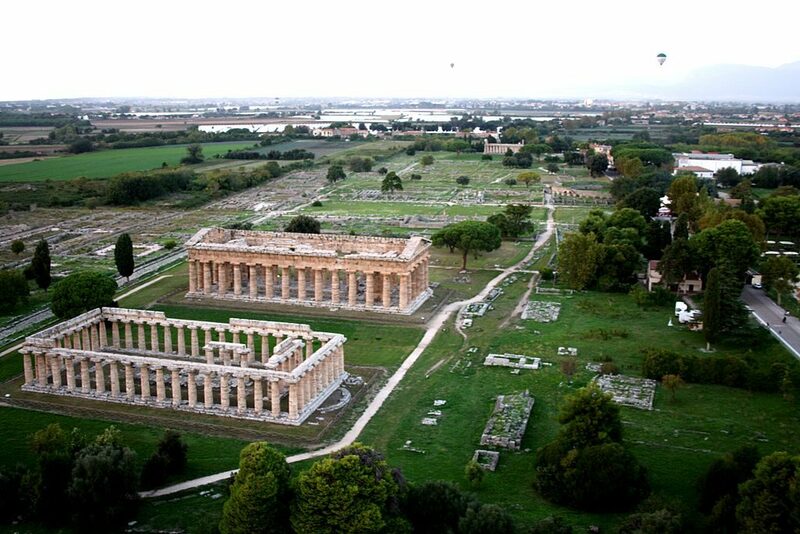 In 273 BC the city became a Roman colony, and its name was changed to Paestum. The Romans started their own building program, enlarging the city and erecting thermal baths, an amphitheater and a Forum on the site of the Greek agora, but were so stunned by the magnificence of the temples that they decided to leave them exactly as they were. 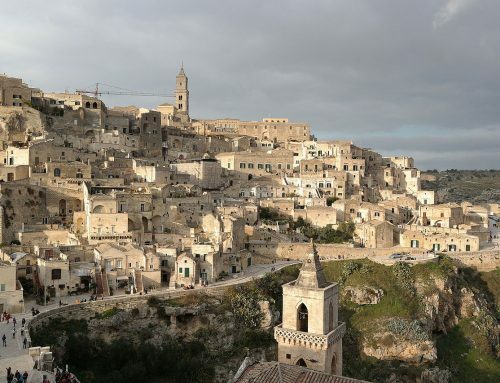 The city was abandoned and rediscovered in the 18th century. Most of the vanished city is still hidden under agricultural land. 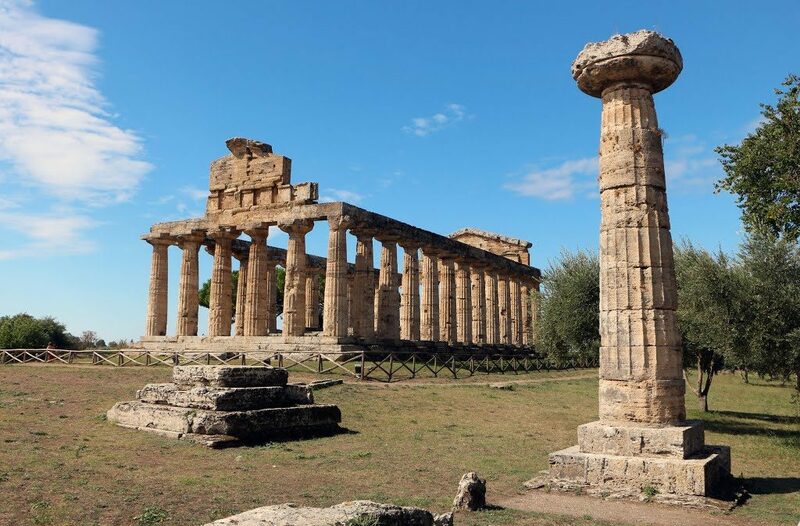 A number of top boutique tour companies offer exclusive guided trips and private tours to the archaeological site at Paestum, with qualified and experienced English-speaking guides. 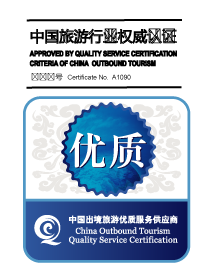 Guided tours usually include pick-up and drop-off at your hotel, private luxury vehicle with English-speaking driver and free Wi-Fi internet service. 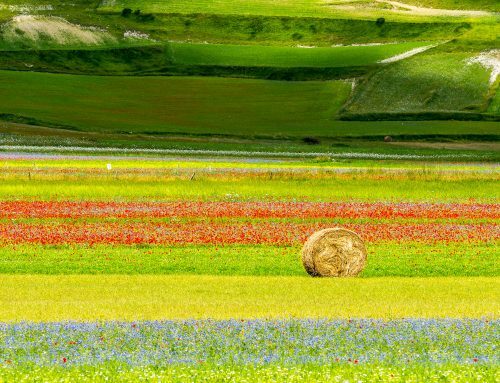 The tour may also include a Buffalo Mozzarella itinerary, visiting mozzarella factories producing delicious buffalo mozzarella cheese. Not far from the archaeological site, a sandy beach attracts vacationers too. 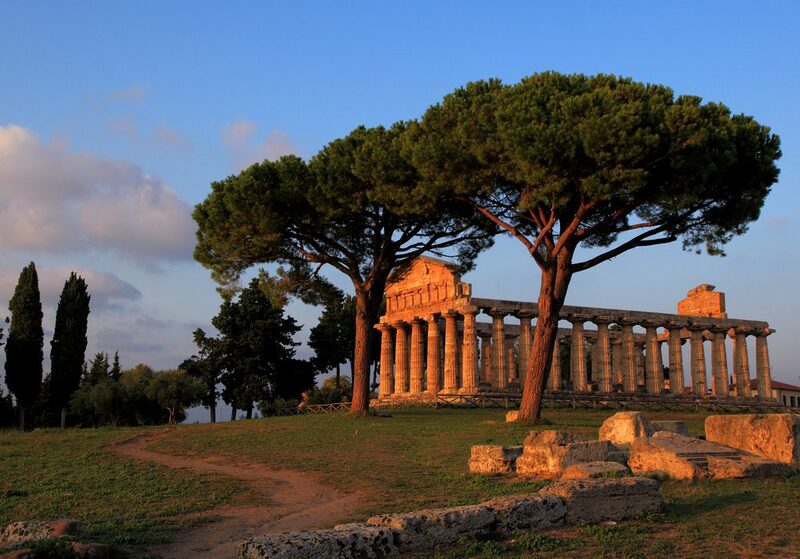 Paestum’s priceless treasures are the three ancient Greek temples in the Doric order. The smallest of the three, originally dedicated to Athena, the goddess of wisdom and arts, is known as the Temple of Ceres (Cerere), and became a Christian church in medieval times. 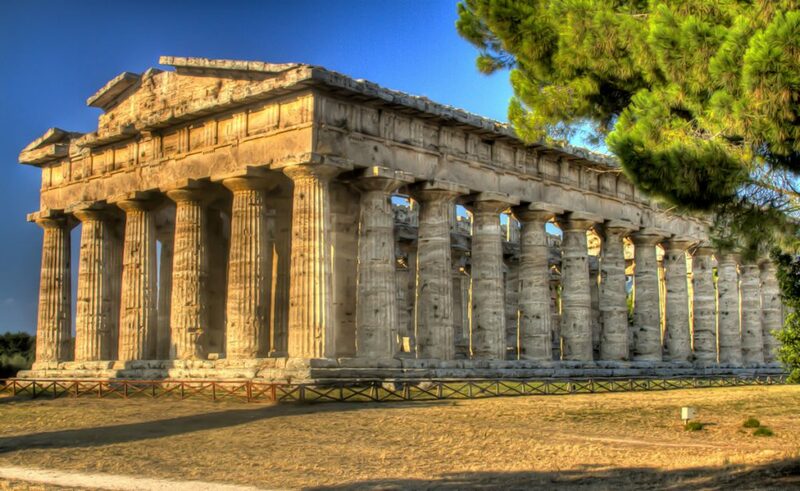 The Temple of Ceres in Paestum. At the further end of the archaeological site is the Temple of Hera, dating from the middle of the 6th century BC. Also known as basilica, it is Paestum’s oldest surviving monument. The best-preserved is the limestone Temple of Neptune, or Poseidon, dating from about 450 BC, one of the finest and most imposing surviving examples of Doric architecture in the world. Near Paestum, in the countryside of Capaccio, there is a wide selection of country-style hotels, which can make a comfortable base for visiting the ruins. 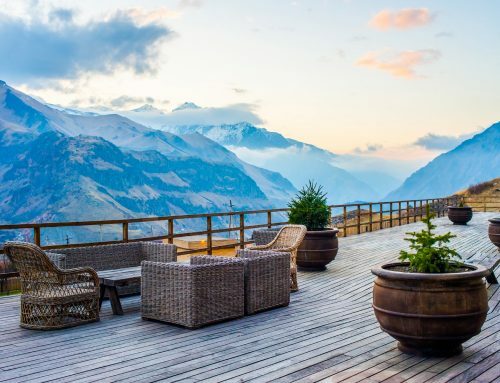 Boutique hotels and luxury resorts are grouped close to the coastline, about a mile away, between the Amalfi Coast and the national park of Cilento.